Sing for Hope comes together each year to place pop-up pianos in the most unexpected of public places with the goal that people will sit down and treat themselves or passersby to a musical interlude. The organization's vision is to ensure "that all New Yorkers — from Rockaway to Riverdale, Stapleton to Sunset Park — have access to the arts." Each piano is designed by a different artist, and each will feature special performances in addition to the daily open public play. Bryant Park is proud to be a returning location for this ambitious project that invites participation and engages public spaces in a meaningful way. Our Subway Quilt piano was created by Jillian Logue, and can be found nestled just north of Fortitude the Lion beneath the boughs of the honey locust trees in front of the NYPL's Stephen A. Schwarzman Building. Visitors to the piano yesterday could have heard a scheduled performance by jazz pianist Benjamin Rosenblum, or a less formal performance of Taylor Swift's pop country song "You Belong with Me" by a young man, who happened upon the piano and couldn't resist the call of the keys. 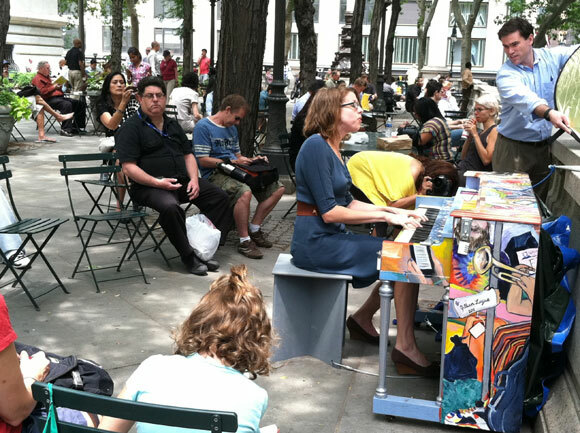 Please note that the Bryant Park Piano located behind the NYPL building near the Bryant Park Grill is not intended for public use. However, our pop-up piano, and the 87 others throughout the city, will be available to anyone and everyone through Saturday, July 2nd.